David Edwards joined a panel discussion “Technology Solutions for Investment Management” this past Thursday February 7th at the IC Summit for RIAs in New York City. Heron Wealth is recognized for leading the wealth advisory profession in adopting technology to enhance the client experience. 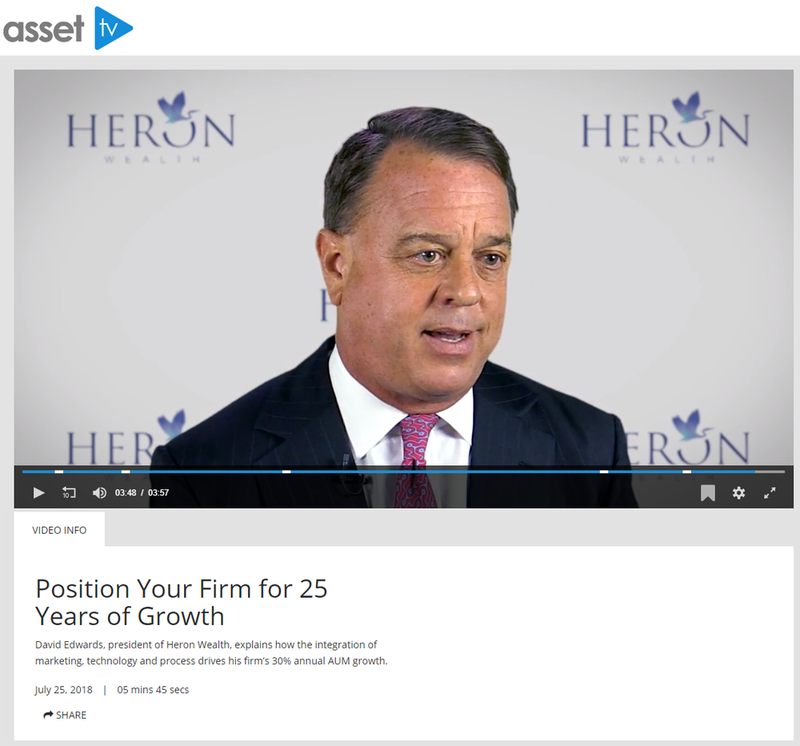 David Edwards, president of Heron Wealth, explains how the integration of marketing, technology and process drives his firm’s 30% annual AUM growth. All students, even those from affluent families, should submit an application. This week marks the start of the FAFSA (Free Application for Federal Student Aid) race, which ends June 30th. Listen to David Edward's Interview with Stewart Alexander of Impact Makers Radio in which he discusses the glide path to retirement. Failure has always intrigued me, largely because many people aren’t typically willing to open up about it, which makes it a mysterious topic. The goal of our question and answer series is to put failure front and center to help aspiring entrepreneurs get a bit of a back-stage pass to some of the most well-respected entrepreneurs in America. Working with top advisors like David Edwards, founder and president of Heron Wealth is a real joy. Marie Swift of Impact Communications spoke with David to uncover some of his secrets to success. David provides some great insights for fellow financial advisors. There are lots of great ideas and much to emulate here. David Edwards presented the story of how he evolved his wealth advisory practice from a solo practice managing $75 million to a team operation managing $300 million in 5 years. The broad-brush tax proposal released Wednesday by President Donald J. Trump repeated his campaign pledge to repeal the estate tax, but failed to provide financial advisers with any additional detail regarding its form. Advisory firms are trying to figure out how to leverage their networks and technology to profitably expand their client bases.Client segmentation strategies can provide that opportunity when firms align their resources properly. In the old days, before the iPhone, a financial advisory firms could get away without updating their technology every year, but not anymore. As consumers go mobile, they expect advisors to be up-to-the-minute with the latest technology. Almost everyone uses the web or mobile technology and expects to get info on a 24/7 basis. After launching its robo for retail investors last summer, Fidelity Investments is forging ahead on a revamped technology platform for advisors. By mid-year, the asset manager and financial services custodian expects to offer its 3,000-plus customer base of RIAs and brokerages a whole new set of online tools to manage client portfolios. David Edwards featured in "The Most Influential Advisor Video Blogs"